John R. Thierstein (1867-1941): a Mennonite ([[General Conference Mennonite Church (GCM)|General Conference Mennonite]] [GCM]) teacher of modern languages, editor and conference worker; was born in Bowil, Swiss canton of [[Bern (Switzerland)|Bern]], 22 July 1867. In 1882 the family came to America and settled on a farm near [[Whitewater (Kansas, USA)|Whitewater]], Kansas. He attended the Mennonite Seminary at Halstead, graduating in 1892, and secured his A.B. degree in 1896 from the University of Kansas. On 2 October 1895, he married Margaret M. Dirks. North Newton: #2009-0148'']] John R. Thierstein (1867-1941): a Mennonite ([[General Conference Mennonite Church (GCM)|General Conference Mennonite]] [GCM]) teacher of modern languages, editor and conference worker; was born in Bowil, Swiss canton of [[Bern (Switzerland)|Bern]], 22 July 1867. In 1882 the family came to America and settled on a farm near [[Whitewater (Kansas, USA)|Whitewater]], Kansas. 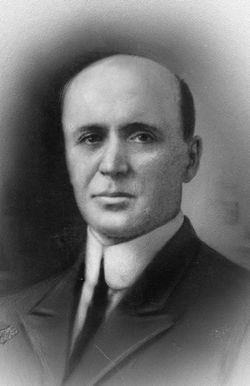 He attended the Mennonite Seminary at Halstead, graduating in 1892, and secured his A.B. degree in 1896 from the University of Kansas. On 2 October 1895, he married Margaret M. Dirks. Thierstein had begun his teaching career upon his graduation from the Halstead Seminary. He taught in several Kansas schools 1896-1903, and at Bethel College 1903-4. In 1904 he became president of [[Freeman Junior College Bulletin (Periodical)|Freeman Junior College]], serving for four years. In 1908 he returned to Switzerland for graduate work, receiving his Ph.D. from the University of Bern in 1910. His dissertation was entitled <em>Novalis und der Pietismus</em> (Bern, 1910). For five years he then served as principal of the Atchison County (Kansas) High School. In 1915-21 he served on the faculty of [[Bluffton University (Bluffton, Ohio, USA)|Bluffton College]], after which he came to [[Bethel College (North Newton, Kansas, USA)|Bethel College]] where he, served until his death in such capacities as professor of education, German, and French, director of the teacher placement bureau, and editor of the <em>Bethel College Monthly</em>. Schmidt, John F. "Thierstein, John R. (1867-1941)." Global Anabaptist Mennonite Encyclopedia Online. 1959. Web. 23 Apr 2019. http://gameo.org/index.php?title=Thierstein,_John_R._(1867-1941)&oldid=101861. Schmidt, John F. (1959). Thierstein, John R. (1867-1941). Global Anabaptist Mennonite Encyclopedia Online. Retrieved 23 April 2019, from http://gameo.org/index.php?title=Thierstein,_John_R._(1867-1941)&oldid=101861.